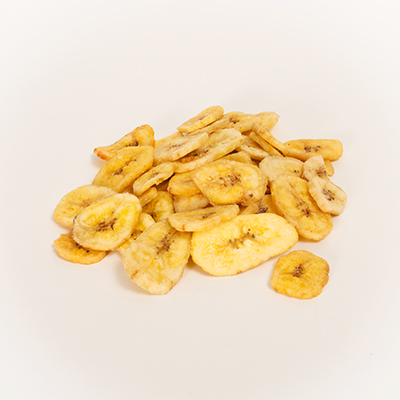 Banana Chips: 12 oz Bags « Great Lakes International Trading, Inc.
Sweet and crunchy Banana Chips are a tasty snack and a wonderful addition to trail mixes. 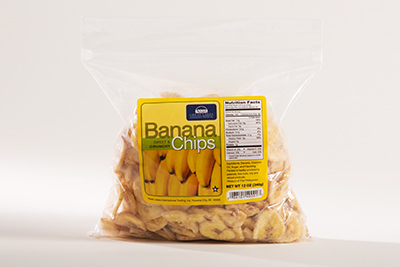 Each bag is labeled with complete nutritional data, UPC code, Star-K’s kosher logo. UPC code #0-86101-40001-7. Product of Philippines. Great Lakes item #308. Each carton contains 20 x 12oz net weight bags. Each carton measures: 16” x 12” x 9”. The total net weight per carton is 15 pounds. There are 80 cartons per standard 40 x 48 pallet. Great Lakes International Trading, Inc.